Maddy spent nearly five years in a puppy mill, having litter after litter. During those years, this French bulldog was known as 86, a number tattooed on her ear. Her feet were damaged from standing on wire all her life, and she didn’t know how to walk. At last, her little body gave out, and she could have no more puppies. Fortunately, rather than destroying her, the breeder relinquished her to All Rovers Rescue Friends (ARRF), based in Toledo, OH. 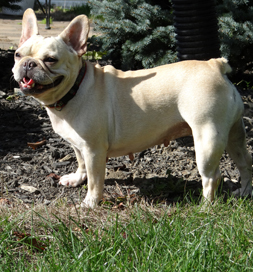 Maddy enjoys a home and yard after years in a wire cage in a puppy mill. It was a blessing. Then a second blessing entered her life: Jessica Barone saw her on Petfinder and traveled from her home in North Royalton, OH, to Michigan, where Maddy was being fostered, to adopt her.The transition to a real home wasn’t easy. “We couldn’t get her to eat from a bowl for several weeks,” Jessica recalls.” “We assume she preferred to eat off the floor because that was what she was accustomed to.” She didn’t know how to go up and down stairs and wasn’t house trained. In the past year and a half with the Barones, Maddy has blossomed. She has become outgoing and enjoys visitors and the Barones’ other dogs. But she saves her greatest affection for the Barones, who took her in when she needed them. “She loves us in a way that only a rescued dog can,” Jessica says. And they love her right back with all their hearts.